This work is a large-scale theoretical model that explains the PDF - Planetary Distance Formula of our solar system. In time as new planets are discovered, the formulas within my model will be validated as the correct model to explain the simple astro-mechanics of our solar system. This simple model is based upon something we have tried to observe for quite some time. That is the carbon 12 atom. Yes, my solar model resembles in great detail a carbon 12 atom. Can it be that humans, a complex carbon life form, actually live on a planet within a solar system designed to resemble a carbon 12 atom? My model explains such anomalies as the asteroid belt, the formation of huge gas giants and the abnormalities of Venus and Neptune to other planets in our known solar system at this time. The most important PROOF to show that this model is correct; is there will in the very near future be several discoveries of new planets in our solar system. The orbits of these unknown planets will align correctly to my theorized orbits. This is the only PROOF that can really validate a theoretical work such as this. If the known qualities of the solar system fit the model and it predicts accurate future unknown variables but probabilities correctly, then such a model can be considered correct. Some long held truths will be completely shattered in my work. New ideas about the solar system and the universe will be put forward that will become accepted facts in the future as my model is validated by the discovery of new planets that fit my model precisely and invalidate other models as incorrect. A few theories such as Titius-Bodes (an old planetary distance law see footnotes) will be completely rebuilt to explain a doubling law that is built into most if not all life. Titius-Bodes is slightly incorrect in the big model of the solar system that I am revealing here. However, it did serve its purpose in trying to explain a key to my model, which is a doubling law. A variation of Titius-Bodes aligns two of the three sets of numbers I use. Titius-Bodes is to me nothing more than a doubling law that I call 1 3 7 (the "fine-structure constant" of quantum electrodynamics - see footnotes). Physicists will immediately smile and say, okay an attempt to explain 137. My theoretical doubling law that I call the Law of 1 3 7 is a universal constant that explains planetary distance formation. It also explains why Titius-Bodes works to some degree. The reason Titius-Bodes cannot fully explain the solar system is that the solar system is actually built around three separate groups or sets of numbers that are simply aligned to each other. Such an ordered alignment for three types of particles/planets does exist within a carbon 12 atom, and it is a key part of my model of our solar system. The similarities are clear. The reason no one has seen this alignment of orbital numbers before, is that many of the key planets needed to prove that this alignment of orbital numbers was real no longer exist. So my theoretical orbits must for now show the alignment of the three groups of numbers. However, the discovery of new orbital numbers from unknown planets in the future will correctly align to the sets I explain in this work, and that will validate that my theorized missing orbits must have existed in the distant past when the solar system was very young. Our solar system is now very mature and the orbits are quite stable, however as simple observable models show, a newly established gravitational field is quite unstable in the beginning until a certain synchronization manifests aligning the various parts. I will explain this a little more in just a bit. Some of my earlier work such as the Creator Formula (Circumference Ratio Earth Aligned To Orbital Ratios - see foot notes) and my recent PROOF for the Creator Formula (a clear ratio relationship between Earth to Mercury/Mars/Jupiter/Saturn) are validated in this work. 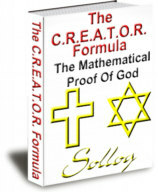 A problem some found with my earlier work the PROOF for the Creator Formula is the Venus exception or anomaly. This exception rule is now easily explained. Venus should not align to Earths orbital ratios as the other inner planets do! The PROOF for the Creator Formula just explained that Venus is an exception to an observable ratio relationship between Earth and the majority of the inner planets. The PROOF of the Creator Formula shows the same type of alignment ordering of numbers similar to what occurs within a carbon 12 atom to the Earth’s inner planets perfectly. My solar model creates three sets of numbers that are all aligned to a simple doubling law that I call 1 3 7. It resembles Titius-Bodes, but only in the fact it uses doubling. Titius-Bodes observed a possible doubling rule of order but it never theorized that three sets of numbers for this rule existed in our solar system. Now that I have discovered that three separate sets of orbital alignments exist in our solar system, the concept of Titius-Bodes can be easily understood. Pi is also a key in my model, and part of the reason is that our planets create in some instances near perfect circles in their orbits. So a bunch of circles should have some type of Pi ratio just by the geometrical properties inherent in circles. I have divided this model into several parts, the first three parts deals with the clear alignment of numbers in the orbits of 18 planets. You might be saying how can I use 18 orbits when we only know about half that many. My model theorizes orbits that don’t exist any longer and it also theorizes orbits of planets that we have yet to discover. While I cannot empirically prove an orbit once existed in the asteroid belt, it will be accepted in the future that several most likely did as other orbits of unknown planets are found that validate my solar model. A few other orbits that also no longer exist are in my solar model. They no longer exist due to the simple fact the planets that once held those orbits were absorbed into young gas giants like Jupiter and Saturn. I have never read any major works on astro-physics, since I have my own understanding of the quantum mechanics of our universe. So what I know of other theories about the idea that planets may have collided is little more than some have theorized some planets may have formed by slow collisions and other planets may have collided to form the asteroid belt. These ideas could have been taught to me in school as a child or I may have been exposed to these ideas via shows on PBS or whatever. My interests in life were never astro-physics related. So I didn’t research the whole gamut of ideas out there. My interests in the past 7 years have been geared toward theology and occult knowledge. I use some of this esoteric knowledge to fully explain certain numbers where chosen as starting points in my formulas! I have always enjoyed playing with numbers, but I don’t really make it a hobby. I am interested in the truth, and what is observable in our solar system has lead me to explore within my own database of knowledge a method to explore and explain all of these numbers. This all being said, my model suggests not only an asteroid belt from the collision of two young planets, but also planets that had to have once orbited near the gas giants that no longer exist. Where did these missing planets go? They were merged or absorbed into the young gas giants like Jupiter and Saturn! This may or may not be an earth shattering idea. However, the location of these missing planets is something I don’t believe anyone has ever put forth in a solid solar model to explain this theory. When outer planets are found that align to planets such as Neptune and Uranus, then my missing planet orbits have to be accepted as factual. So here are my three sets of orbits. The numbers I use for known planets are correct as of today since they are the numbers supplied to me by NASA. While you can look up the actual numbers for our known planets for yourself at sites like NASA, the numbers I use for the missing planets are figures for planets that are long gone. But, there will soon be several new planets found in our solar system that align to my model and thereby validate the whole work! The first set of orbits that are aligned to each other is the easiest to verify since four of the planets still exist. The orbit of Planet X is in the asteroid belt. Ancient Myths say this was Niribu. So I will call Planet X Niribu. The orbit of the theoretical planet El-Sollog is near the orbit of Saturn. This is a missing planet that merged with Saturn. When I set out the relationship of these planets we will have a theoretically orbit for Niribu that is aligned to the other five planets in a simple doubling law similar to Titius-Bodes but not exactly Titius-Bodes. I have modified their so-called n set of numbers. The rule of doubling and adding a variable might have been first theorized by Titius-Bodes. However, long before I had ever heard of Titius-Bodes I had theorized the law or rule of doubling for 1 3 7. The best way for me to explain what 1 3 7 means to physicists is that it is the "fine-structure constant" of quantum electrodynamics. It is considered by some to be almost the glue that holds atoms together. While I make no claims to be an expert on quantum electrodynamics, I will admit that I have written many computer programs over the years, since I spent most of my adult life running a computer programming company. I probably had to ask in what manner were the numbers being used. I most likely would have noticed a relationship to my birth date of 7/14 or 14/7 in Euro dating. I knew from my father’s mother that 1 4 7 was her lucky numbers. She told me as child she started playing them after I was born in the so-called daily number and at the track. She said they always seemed to hit for her. So as a child I was indoctrinated in how 1 4 7 were lucky numbers. Anyway, at that point in the argument I was probably given a simple overview of 1 3 7. I do remember what my reply was. “It’s simple, it’s a law of double add one. You start with ONE, you double and then add one, then double then add one. This simple statement produced 1 3 7 and I thought nothing much of it again for many years other than whenever someone seemed to comment on the mysteries of 1 3 7 I would say, “Haven’t you heard of the law of double and add one?” I would then explain what I theorized at around the age of 13 to whoever was discussing the great significance of 1 3 7 to me at that time. I’d had maybe a few dozen discussions before I theorized my PDF formula in my lifetime, where I explained the law of doubling or 137 to someone. When I was first exposed to Titius-Bodes, all of less than a week ago, I immediately saw my 1 3 7 Law in it. At first I tried to tweak what some considered some great secret of the solar system. At first I was impressed with how close Titius-Bodes was. I then realized it was totally wrong and would not correctly locate future orbits without more manipulation of my addition variation to Titius - Bodes (a simple variable I created to improve Titius-Bodes a few days ago - see foot notes). I use the law of 1 3 7 in all two of the three sets of my orbital numbers in my model. It is not pure 1 3 7 as I knew it originally, but it is a simple double a number to start and then add a constant variable. Some will say it is Titius-Bodes. It is not. It is the natural law of doubling inherent in all living things. It is 1 3 7 with perhaps a dash of Titius-Bodes. This first set of six orbits starts like Titius-Bodes with two numbers. The first number adds the variable to create the first orbit or Mercury. Then like Titius-Bodes the first number is not doubled. My other two formulas that create sets of orbits are slightly different. One starts with a number and then keeps doubling. While another one subtracts a fraction of 2/3 to create the numbers for orbits. So one may say Titius-Bodes is 1/3 relevant to my model. Titius-Bodes starts with 0 and 3 as the first two numbers. Once three is in the picture Titius-Bodes starts doubling and adding .40 or 4/10. My first set of numbers like Titius-Bodes contain a zero as a starting point, but my second number is not 3 or .3 (I use fractions so I don’t have to divide by 10 as Titius Bodes does) it is .60. As in 60 the year I was born. As in 60, the base math of the Babylonians. My variable in the first set of numbers is .40 like Titius-Bodes, so my variable and .60 make unity or one. “ONE is all there is”, is a favorite saying of mine. So what better place to start than a couple of numbers that make unity. Seems simple enough right? Oh, the first number becomes .40 due to adding the variable of .40 to zero. So the total sum of the first number and the variable of .40 by adding the second number to it is once again unity or one. Titius Bodes originally looked like this. Titius bodes does not try to explain why 0 and then 3. As I explained above unity is the basis of my first formula. By deleting 3 from my first formula I am excluding the backwards planet Venus from my first aligned set of numbers. This validates my PROOF of the Creator Formula. Venus does not belong in any formulas that try to align earth to other inner planets. Venus is actually part of another set of numbers aligned to Neptune and a doubling of Pi. With my numbers above I create near perfect orbits for the first six planets of my model. Earth and Jupiter are perfectly aligned with this formula based upon earth as 1 AU. These are the larger two of the four still existing planets created by the first formula. The reason Earth and Jupiter are still perfectly aligned could be due to how much bigger than the other planets they are. Also the moon of earth could be a reason the earth has stayed in the original orbit designed for it. It is theorized that with time most or all of the planets will gravitate closer if not into the sun. Titius-Bodes never tried to explain why certain orbits were slightly off in their theory. Titius-Bodes also tried to align Saturn to this formula. Saturn is aligned to a third set of numbers. If we did not use the Titius-Bodes variable of .4, then Saturn is perfectly aligned to 9.6 AU. However, in Titius-Bodes you have Saturn lumped into a simple group of all the planets. Saturn merged with the original planet in my first set of planets, a planet that once existed close to Saturn at 10 AU. That planet is El-Sollog. El is the ancient name of GOD in Hebrew. El is the number 31 in Kabbalah. 31 is Pi^3 with a remainder of .00006. I have chosen to append my own name to this planet named for GOD, since it is my belief GOD inspired me to create this correct model for our solar system. It is my belief my model demonstrates clearly that an intelligence designed the solar system. I won’t debate that point in this work, but I will in a later work. So I am giving GOD credit by naming the planet that was in a PERFECT 10 orbit EL-Sollog. I as a mere servant of GOD get a footnote. The theoretical orbit of Planet X or Niribu is 2.8 AU. That puts Niribu in the Asteroid Field between Mars and Jupiter. So far so good, we have 6 orbits, two of missing planets, one of the missing planets left a trail called the asteroid belt. The only debatable point is if a planet in a 10 AU orbit had a slow collision with Saturn in a 9.6 Orbit. Like I said, I don’t plan on proving the missing planets existed in this work. I merely explain where they had to have been and supply a formula that will accurately predict the orbits of planets about to be discovered. When these planets are discovered and they align to my solar model, then the PROOF the missing planets at one time existed will have been given! Another good reason to think Saturn somehow absorbed another planet, is to try to explain why Saturn and Jupiter are so much larger than the rest of the planets. Absorption due to a slow collision makes perfect sense. I am not the first to say this is a possible way some planets are formed. Now I will explain the formula for my second set of numbers that locates 6 additional orbits of planets. This set contains three known planets and a theorized orbit for a planet yet to be discovered. It also contains two orbits of planets that no longer exist. One planet is most likely to have collided in the asteroid belt with Planet X or Niribu. I call this missing planet the Planet Y which is short for Yod. The other missing planet I have named Planet Z short for Zeda or Zeta to fans of the channeled work many or discussing. This planet merged or was absorbed into Jupiter. They are similar to a ghost on a television set. They are a sort of interference, that doesn’t belong in the picture. Can I prove two planets existed near each other in orbits in the asteroid belt? No. But, when other planets are found that align to orbits I have given in this solar model, these planet will then be taken to have existed for fact! Can I prove a planet existed near the orbit of Jupiter that was somehow absorbed or merged into Jupiter? No! But, once again as other planets are found that align correctly to my solar model these missing planets will be taken as fact! This set of numbers is a blend of Titius-Bode, but there is no variable to insert. It is just start here at one number and double, double, double. This is the only set with no variable in the doubling. This set contains mostly numbers from Titius-Bodes. The first number or starting point is 2.4. Why 2.4? Well since this solar model is based upon AU or a relationship to earths distance to the sun, why not start with 10 percent of an earth day of 24 hours? One-one-thousandth of earths circumference in miles is also 2.4. The ratio of 2 to 4 is .50. A perfect half. Four divided by 2 is two. 2 is the first even number, it is the first number that can be squared. 2^2 is four. 2 is the only even number that is prime, while four is the first number that is not prime. So 2 and 4 belong together for many reasons. 2 to 4 is also a simple explanation of the law of double as well. So a starting point containing 2 and 4 is a well-designed location to start in my opinion. Just like unity was our starting point in our first set of numbers, this number is our second starting point. Start at 2.4 and DOUBLE five times! The first location in this sequence is part of the asteroid belt. The fifth number in the sequence is the Kuiper Belt. Two of our known planets are perfectly aligned in AU to this sequence of numbers, the gas giants Saturn and Neptune are where the third and fourth numbers in this sequence suggest. The fifth number in this sequence is exactly where the Kuiper Belt is located, it is where both Pluto and Quaoar now orbit. In the future Pluto will be considered nothing but a moon of a planet that no longer exists. I call this missing planet Theth, in Hebrew it means Ninth, and since this orbit is now associated with Pluto or the so-called ninth planet, I thought Theth was a most appropriate name. Theth exploded and formed the Kuiper Belt. The recently discovered object temporarily named Quaoar is a Pluto like object only Quaoar has a near perfect circular orbit around the sun around 42.00 AU. The original planet Theth, that no longer exists, was located near 38.40 AU or the heart of the Kuiper Belt beyond Neptune. Pluto's erratic orbit can now be easily explained by considering that it once orbited planet Theth along with its moon Charon and Quaoar. A collision or a core meltdown of the parent planet to Pluto (Theth) hurled Pluto into its current erratic orbit. Gravity has averaged out the orbit of Pluto to around 36.00 AU, though at times it's orbit can be within Neptune and beyond the newly discovered Quaoar. Quaoar most likely had a slight change of orbit from near 38.40 AU to around 42.00 AU since it was not directly impacted by a direct blast when the parent planet of Pluto and Quaoar (Theth) was destroyed. So the blast of Theth's destruction bumped the orbit of Quaoar a little further from the Sun, and it dramatically altered the orbit of Pluto to what we now see. If we average the orbits of Pluto and Quaoar we have the perfect orbit that my theory suggests for Theth, that being 38.40 AU. This is the first theory that explains properly Pluto's small size similar to a moon and it's erratic orbit. It was a moon of Theth and is not a planet. The same thing can be said of Quaoar, it was a moon of the same planet that Pluto was a moon to! The Kuiper Belt is also explained with this theory. It is exactly where it should be if we consider planet Theth once existed at 38.40 AU. While many small objects have been found in the Kuiper Belt, very few will be spherical planet/moon like objects such as Pluto and Quaoar. The only question is what destroyed the original planet that Pluto and Quaoar once orbited that being planet Theth? Was it a collision? Or was it a core meltdown from a defective core? The idea that the Kuiper Belt is left over debris from early planetary formation is wrong. The Kupier Belt is exactly where a planet should be! The Kupier Belt is estimated to be only one tenth the mass of earth. That is hardly enough material to prove that some celestial quary to make planets was the reason for the Kuiper Belt. A planet was at 38.40 AU as my theory suggests, it was Theth and it exploded and formed the Kuiper Belt. Its moons were left behind, those being Pluto and Quaoar and any other spherical objects found in the Kuiper Belt if any. This formula predicts an orbit of a planet beyond Theth or the Kupier Belt, Pluto and Quaoar. When one is located in the predicted orbit, then the theory of the other two orbits that are for missing planets will be considered fact. Those are the missing orbits for Planet Y and Z, good old Yod and Zeda. Here are the numbers for my second set of planet orbits. Now it is time to give my third set of numbers for planetary orbits. This set is nothing like the other two sets! It is my favorite set of numbers too, since it has two planetary orbit locations that have undiscovered planets that in no way are near anything Titius-Bodes predicts. This set of numbers also aligns pesty Venus and Neptune. They are the big anomalies in our solar system. I explain why they are where they are in this formula! Yes, you can say I saved the best part for last! This set of orbits proves absolute design to this solar system. The factor of the doubling is Pi. The variable is 2/3 or .666. The variable is a negative or minus. The starting points is a classic esoteric number that is a major name in the bible in Gematria, that is ALPHA-OMEGA! Do you really want to argue proof of DESIGN in my solar system model when the key UNKNOWN PLANETS that are discovered soon will be aligned perfectly to a formula that begins with ALPHA-OMEGA as the starting point? This is my third planetary orbit formula in my solar model. As you can see, THIS IS A COMPLEX AND INTELLIGENT SEQUENCE OF NUMBERS! There is no way someone can say to me this was a random event. Why start at 1.332? That is double .666 the variable. Why a variable of .666. Does not this whole model of a solar system revolve around three sets of six numbers or three sixes? Now some will say wow EVIL, is not EVIL backwards LIVE? In gematria, the Greek THEOLOGY of numerology based upon the Greek Alphabet, the number 666 was used for a bad person. Well in reality in ancient Greece 666 was a holy number, since it is used to square a circle! 666 and 888 square a circle. By the way, in Greek gematria Jesus is 888. Now in GREEK the name ALPHA-OMEGA has a value of 1332. Was the designer of the solar system a GREEK? The Alpha-Omega is unity or a circle. It is a symbol said to represent GOD, he who was the first and he who shall be the last. Actually a circle has no beginning or an end so 1332 or double the variable of 666 represents unity in gematria. I’m sure there aren’t too many astro-physicists walking around with such esoteric knowledge. Now 666 is special to me also, since upside down 666 is 999. 999 is also NINES and my birth name was ENNIS or an anagram of NINES. I guess I was destined to reveal this solar model. Venus and Neptune the two planets that destroy every typical solar model such as Titius-Bodes, etc. are perfectly aligned to this third formula. Two planet orbits no longer exist, but two unknown planet orbits are theorized by this formula. These planets will validate this solar model in the future. Another GODLY part of this formula is the fact Pi^3 appears. Pi^3 is 31.006. 31 in Hebrew Kabbalah the equivalent of gematria is Aleph Lamed. Translated as GOD or EL. So GOD’s main name in the Hebrew bible is encoded in the formula as Pi^3. Is it coincidence or DIVINE DESIGN? I won’t argue the point in this work, but I will in a later analysis of PDF. In the future when planets are found that align to the theoretical location of orbits I have given, well let’s just say this solar system model will do what Einstein searched his whole life for. It will unite the physical world to physics and theology. It will be PROOF of Solar design to scientists and theologists alike! These are the orbital numbers produced by my third formula, I called it Pi^3. The true Perihelion of Venus is .668 our .666 is actually .667, so this formula is aligned to within .001 or the closest orbit of Venus to the Sun. That is not in AU it is in 10^8 miles. The AU of Venus is considered to be .720. The Perihelion of Neptune is 30.220, so we are once again within 1 to the third digit for a Perihelion measurement of a planets orbit. No one has ever aligned both Venus and Neptune in a formula within 1 to the third decimal place! This means this formula creates the Perihelion of orbits. The other two formula creates perfect AU’s. This formula creates Perihelion (10^8 miles). This is once again an argument for DESIGN rather than random chance. As unknown planets (U2 and U3) are found that align perfectly to this formula, it will validate my solar model as being PROOF of Solar Design to our Solar System! The second planetary orbit created in this formula is an orbit that once again places a planet in the orbit of the asteroid belt. I doubt all three collided at the same time. The iron asteroids in this orbit make it look like a very fast early collision occurred at the iron core level of two young planets. It is quite possible that one of the planets of this triplet orbit then spun out of control most likely into Jupiter. It could have been any of the three asteroid distance orbit planets in any of the three sets. Which one it was is irrelevant. However, I have decided to name the second planet in this set Juno. Juno is the wife of Jupiter in mythology so when the triple planet orbit was broken by a collision of two planets, Jupiter got his wife! The third planet I have named Nikkee the Goddess of Victory. For Nikkee is my earthly goddess companion/wife. So Nikkee of course merged with Saturn and El-Sollog. Three sets of six planets, the dreaded 666 that is also the basis of a carbon 12 atom, with all the orbits to known planets perfectly aligned. We have the orbits of planets that collided and created the asteroid belt. We have an explanation as to why some gas planets are so large. We have LOGICAL starting points in all the sets of numbers. We have LOGICAL progression of the numbers creating perfect orbits to known planets. In time the undiscovered planets will be found. 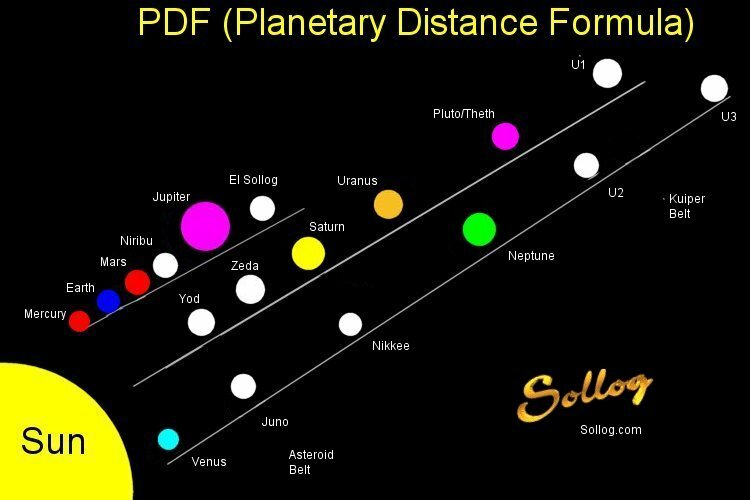 They will align to my solar model, and in the future Physics, Theology, Mathematics, Philosophy, Astronomy and Science all begin with a lesson on PDF, the Planet Distance Formula. The key to any type of PROOF for this solar model is watching to see at what orbits the next planets discovered in our solar system are found to have. With the discovery of DW 2004 on February 17th 2004 (ONE DAY before the 74th Anniversary of the Discovery of Pluto - 1 74 or 147), it is now clear that the Kupier Belt is similar to the Asteroid Belt in that it was formed by the collision of at least two planets. Two of these planets resided at approximately 38.4 and 62.0 (10^8 Miles). The orbits were very elliptical and the orbits crossed each other, which eventually caused a collision and formed the Kupier Belt. Pluto and Quaoar are moons of the planet at 38.4 (10^8 Miles) that I called Theth above. DW 2004 is a left over moon from the planet that was originally at 62.0 (10^8 Miles). I called this planet U2 above. The Kupier Belt confirms that two planets collided, the fact that Pluto and Quaoar remain in orbit near where Theth should have been according to my theory and that a new moon type object similar to both Pluto and Quaoar has been found near where I theorized U2 would be is validation that DW 2004 is the moon of U2 and Pluto and Quaoar are the moons of Theth. If the Kupier Belt is found to extend out as far as 93.0 (10^8 Miles) which some have already theorized, then both U1 and U3 have suffered the same fate as U2 and Theth, that being they were destroyed by collision. The current estimates of the width of the Kupier Belt fit well with the theory that the Kupier Belt may contain the material from 4 destroyed planets. However, a gas giant similar to Neptune may be found where U1 and U2 are theorized to be located. That would mean U1 and U3 collided and formed a gas giant. So in the future the discovery of additional objects similar to Pluto/Quaoar/DW 2004 may be found in the Kupier Belt. Objects closer to 38.4 (10^8 Miles) are moons of Theth. Objects closer to 62.0 (10^8 Miles) are moons of U2. If any such Planetoid objects are found where U1 and U3 are theorized to be located, then they are moons of the planets that once resided there. Only time will tell what remains in the areas at 76.8 AU and 93.0 (10^8 Miles). It will be either moons of planets that were destroyed, a Gas Giant or perhaps two new worlds. Titius-Bodes Law - Simple Planetary Distance Rule know for a couple of inaccuracies. It is a simple doubling law with a starting point that creates orbital distances to AU by doubling and adding four to a number and then dividing by 10. 1 3 7 - Known in Physics as the "fine-structure constant" of quantum electrodynamics. In Kabbalah 137 is the number of Kabbalah and also the wheel of one. CREATOR FORMULA - Theorized by me in 1995. It states the circumference ratios of earth or aligned to the orbital rations of planets in our solar system. PROOF for CREATOR Formula - Theorized in July 2002 by me, it is a simple PROOF showing how the ratios of four inner planets are perfectly aligned to ratios of earth’s circumference. Titius-Bodes Variance - A formula I created a few days ago to align Titius-Bodes to actual distances to the sun in 10^8 miles instead of AU. Discovery of Quaoar - The discovery of this object has led me to believe that Pluto and it are nothing but moons of a planet that once orbited at 38.40 AU. In time Pluto will no longer be considered a planet. Pluto and Quaoar are left behind moons of Theth. My Theth Theory fully explains Pluto, Quaoar and the Kuiper Belt. Discovery of DW 2004 - This discovery confirms my theory that Pluto and Quaoar are moons as is DW 2004 of two planets that collided to form the Kupier Belt. Visual Aid - The Image Below is not to scale, but it does show how the three sets of planets I have theorized line up.